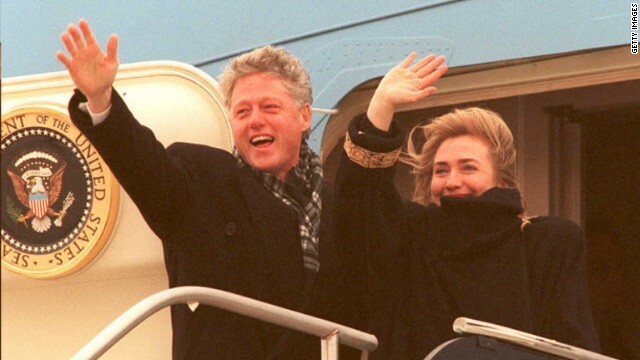 (CNN) – A fifth batch of confidential memos, notes and other papers from the Clinton White House were released Friday by the William J. Clinton Presidential Library. A total of 20,430 documents have been released since February 28. Friday's release of 2,145 documents spans a range of other issues, including Clinton’s final year in office, White House attitudes about the press, meetings with dignitaries, and Supreme Court nominations. One memo from March 1999 shows how advisers coached President Bill Clinton “to dodge question about Lewinsky” in his interview with PBS, so that it would diminish the likelihood of making it into the final cut. Curiously, another possible question–asking about the importance of Hillary Clinton to his presidency–had no answer in the memo. Putin had just been elected president at the time. He and Clinton had met twice before when Putin served as prime minister of Russia. The dinner marked Clinton’s final trip to Moscow as president. The signing of baseball star Darryl Strawberry by the New York Yankees following his second drug suspension apparently reached Clinton's desk in 1995. As he was preparing for his 1996 State of the Union address, Clinton argued to his aides that Republicans wanted to eliminate the Commerce Department because he had nominated Ron Brown, who was black, for the job. “The reason they want to get rid of the Department of Commerce is, they are foaming at the mouth that Ron Brown is better than all of those Republican corporate executives who got those cheeky jobs because they gave big money to Republican presidential candidates. And here is this black guy who is a better Secretary of Commerce than anybody since Herbert Hoover,” Clinton said. In a memo dated June 1, 1998, advisers recommend turning the Monica Lewinsky investigations against Republicans. “It will be two years of non-stop investigations with little outcome or public support and huge taxpayer expenditure. The nastier they get, the more our base will want to turn out to end this,” the memo states. “Assuming the same outcome of all the investigations from here to election day – the argument that the Republicans spent more time and taxpayer money on investigations than Medicare and Education combined is a strong reason to turn out and it is a strong motivation to vote Democratic for independent voters who are sick of partisanship,” it continues. A May 1994 memo from National Security Council legal adviser Alan Kreczko to Donald Steinberg, a spokesman for the NSC, states that the U.S. is not legally obligated to intervene in the Rwanda genocide simply because it’s happening. Clinton later said after his presidency that he regretted his decision not to send U.S. troops to the country. “I don’t think we could have ended the violence, but I think we could have cut it down. And I regret it,” he told CNN’s Erin Burnett in 2012. While Clinton made headlines with the famous phrase “build a bridge to the 21st Century” in his 1996 convention speech after his re-nomination, the phrase has been floated as a potential theme months earlier. But he didn’t use it. A memo from his close friend, Al From, suggests From was promoting that phrase as a key campaign slogan in January. From says in a December 1995 memo that the State of the Union speech should be used “to lay the groundwork for making the 1996 election a campaign between our country’s future and its past." The memo was one of several suggestions from associates on how to frame his all-important State of the Union address, which would serve as a template for the campaign ahead. His suggestions didn’t work initially and didn’t make it into the speech. But after Clinton mentioned it in his convention speech later that year, the President repeated throughout the rest of the campaign—and in subsequent speeches. He was then advised not to over-use it in the State of the Union speech for 1997. Taylor Branch, another longtime friend of Clinton and the President’s secret diarist, recommended that he not use the phrase too much in the big speech because it will remind people of the election. “If you repeat the bridge reference, it will lose force and maybe even boomerang because it smacks too much of the campaign,” he wrote in a January 17, 1997 letter. “To me, the bridge would be most effective if you save it until the good lick at bottom of page 5. By then, you will have sketched the substance of what you see, across the bridge, and 1isteners can say, ‘Okay, I get it. He earned that from the campaign." "My otherwise brilliant nine-month-old son Benjamin is easily distracted by his image in the mirror. So too the press. After the first blood has been let in a scandal, they regularly turn on themselves. An op ed by a respected former press secretary (Powell) or a reporter (a J-school dean) could help prompt this introspection. We would need to compile the most egregious bloopers." Paul Begala, a former senior adviser to Clinton and now a CNN contributor, wrote a draft of Clinton’s farewell speech, but said in a memo to the President that he didn’t include any mention of the President’s wife—suggesting the President himself should write that portion of the speech. He advised Clinton not to list all his accomplishments but rather focus on “American character.” Begala also took a shot at then-incoming President George W. Bush. And what did he say about his wife? The Yankees had a serious image problem when it came to players and drugs. They let a starting pitcher get busted 6 or 7 times for cocaine before they finally got rid of him. Strawberry was treated very differently. Another american detained in north Korea, I'm sorry but if you are stupid enough to go there, then you deserve what you get, tourist, doubt it. I see Bush 41 got a slew of money for some socks. I wonder what Bill Clinton could have gotten for his used underwear if he hadn't deducted them on his tax Returns! Thought we forgot, didn't you? I find this very troubling that the highest levels of our government would be getting involved in private businesses and its dealings with individual players when there were no laws broken. This sounded like government extortion with its demand for contributions, etc. And now Democrats just want everybody to have pot whenever and wherever. "@Just asking- This whole Bergdahl mess has just completely blown up in Obama`s face. The GOP and even a lot of Dems are hacked off about it. Its pretty bad when Feinstein is bent out of shape. Bringing out his puppetmaster and Harry Reid is all they can do but it won`t make a difference." Hardly. Had he left the guy there, THAT would have "blown up in his face." But at least the entire GOP/Teatrolls wouldn't have had to scrub their social media accounts of their contradictory statements and acted like complete and utter hypocrites over it if that was the case. McCain already got called on his flip-flopping by the factcheckers, which of course CNN is refusing to print because they're all running around CNN's offices with wood over the hyperbolic hissy fit their GOP/Teatroll symbiote is feeding them for the nontroversy machine. Meanwhile, one of Faux's bobbleheads quite literally just condoned the idea of his platoon murdering Bergdahl and sending him home in a bodybag if they had found him. sonny crapman – " It wasn't Obama's idea. He wanted to attack but was too afraid to do it on his own "
Yeah, he was afraid to do it on his own. He went to Congress for approval. I guess that wasn't one of his 'Dictator Obama' weeks. Yes, actually taking responsibility for something all by himself is too much to ask of our Commander-in-Chief to do. He wanted to be able to say it was Congresses fault as well if it went south, as most Obama things tend to do. He prefers to use his dictatorial powers on the American people, not overseas. We are a captive defenseless target. Is there any hope that in at least ONE case the guy/gal caught flip-flopping will stop pretending that he/she didn't wrote/said what he/she did and own his/her words? "I find this very troubling that the highest levels of our government would be getting involved in private businesses and its dealings with individual players when there were no laws broken. This sounded like government extortion with its demand for contributions, etc. And now Democrats just want everybody to have pot whenever and wherever." The whole point of it was that the Yankees were a nationally recognized team, and had a handful of players with some serious drug problems, which the organization basically ignored. The players were looked up to by young kids, and here they were setting extremely bad examples and being rewarded for bad behavior. They stepped in and made an example out of Strawberry. ""Pot whenever, wherever." Yeah, Baby!!!!!!! I think it should be required before each meeting the the House and the Senate. They couldn't be any worse. Its all about the acting the show and the fake impression that the Clintons care . Its just tell the voters what they want to hear and do nothing as they run the wayside down a crooked path throwing penny candy and smiling and making hate and dividing americans . And damn those stupid ideal they dream up for the cherry on top . It's hilarious to go over to Faux's website once in a while...the all-Obama-teardown-all-the-time pages. They haven't a single thing up about any of the shootings, including the one today at the GA courthouse by a "sovereign citizen"...but they sure did make sure to have a story about a stabbing. The bubble is a scary scary ignorant place. We all know this is just to keep Hillary in the media, CNN. Your partisanship is GLARING! Most of the times I don't even read just asking idiotic rants–is he that rich to be a republican? I staunchly doubt. Got two words for you.....Richard Jewell. If you don't know who he is look it up, Wiki would be a good start. If the pentagon dismiss all charges of desertion and say they cannot prove them who do you think Bergdahl is going to go after first? The little soldiers who came forward to malign him? Naw I doubt it, I have no doubt they will spend a great deal of their life's income paying him because he shouldn't deny his little buddies, but then that will be peanuts. Now Fox News...thing have changed alot since Mr. Jewell.....attorneys will be lining up in droves to get a piece of this action.....Fox News and the others "News" agencies. Could be worth, oh I don't know, a couple of billion, maybe more. And we have not even mentioned all the little elected reps. who have spoken so irresponsibly. Now thats ENTERTAINMENT. As a former member of the military when you leave your post without authorization under combat conditions it is most likely desertion. And yes I know who Richard Jewell is. If there is a Courts Martial it will all come out. The Evidence is pretty damming against the man. The Obama Administration has Once Again, stepped in it. Sorry but those are the Cold Hard Cold Facts. Sorry to keep harping but your posts never cease to amaze me. I too was a member of that same military, and at the end of your post you say those are the "Cold Hard Facts", but precede it with "most likely", "if there is", opinion, and hearsay. If you were indeed a member of the military then you know you are presenting a very simplistic view of military law. As in all courts, finding black and white is all but impossible now. An old saying, "Theres many a slip 'tween the cup and the lip" is proven every day in military and civilian court rooms. "The Obama Administration has Once Again, stepped in it"
Stepped in what? The Joint Chiefs have stressed he is innocent until proven guilty and that the allegations of desertion do not factor into the equation of determining whether to bring him home and how. You bring him home. Period. NOBODY LEFT BEHIND. We might have to punish him when he gets here, but you. bring. him. home. Gunderson – UM sorry don in albuquerque, As a former member of the military when you leave your post without authorization under combat conditions it is most likely desertion. And yes I know who Richard Jewell is. If there is a Courts Martial it will all come out. The Evidence is pretty damming against the man. The Obama Administration has Once Again, stepped in it. Sorry but those are the Cold Hard Cold Facts. The evidence is pretty damming against the man... so let him have his day in court. Your CHCF don't change the law, and only a military court can say if he's guilty or not of desertion, or you forgot that? Rahm Emanuel, will be vice president in 2016 .